We’ve already got quite the plans with our destination events in Denver, Austin, and Tombstone this year . But for players attending the usual gaming mega-conventions of Origins and GenCon, and/or European events, we bring the one and only, Jonah Essex to the fore. This summer, players will make choices about Jonah’s story as we reveal what other plans he was cookin’ up back in Gomorra and his travels after. We will also find out his whereabouts and who he is with. In addition, we anticipate having Out for Blood legal and available at each of the following round-ups! 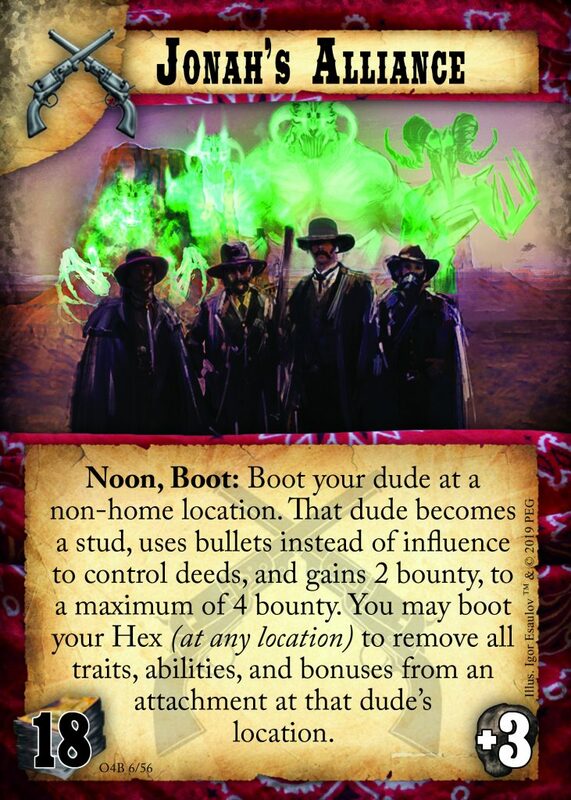 Jonah’s Alliance: Players attending our major European Round-Up this year in Edinburgh (date TBD) will make the choice on Jonah and his team’s location, choosing a new location in the Weird West for Doomtown to focus on! Jonah’s Agenda: Player’s attending Origins from June 12-16, continuing last year’s convention theme of Mystery, will choose what exactly Jonah was planning by answering a series of questions through the main event. We’ve also got several multiplayer and Greenhorn events (learn to play/casual play) scheduled for this convention. Jonah’s Allies: Player’s attending GenCon from August 1-4 will choose Dudes that are part of Jonah’s team, including the winner assisting in choosing a brand-new character to be part of this posse. Similar to Origins, the additional events will focus on multiplayer and Greenhorns. The action will continue in the major Doomtown August 2020 Destination Event in Copenhagen, in appreciation of our international players and playtesters. We hope to make this an event that rivals the fun we had in Manchester at the 2018 European Championship and we look forward to joining our collective Doomtown family across the pond.